I had an epiphany about Brussels sprouts a couple of years ago. The Brussels sprouts of my childhood did not give me warm and fuzzy feelings towards the little cabbages. Conveniently, I would always manage to “accidentally” drop them on the floor or transfer them to the plate of an unsuspecting cousin. But then everything changed. At a dinner party, one of my friends served Brussels sprouts that were shredded (well, thinly sliced) and sautéed. I took a bite to be polite…and then proceeded to eat two more helpings. The texture of the shredded Brussels sprouts made the dish light and easy to eat. Shortly after, I discovered the fantastic flavor of roasted Brussels sprouts and I can now say that they will never find their way to the floor again. When we were doing out monthly “stock-up” at Trader Joe’s this weekend, we picked up this gorgeous stalk of Brussels sprouts. My kids were amazed at how they grow and I was almost tempted to hang up the stalk as a decoration! Almost. 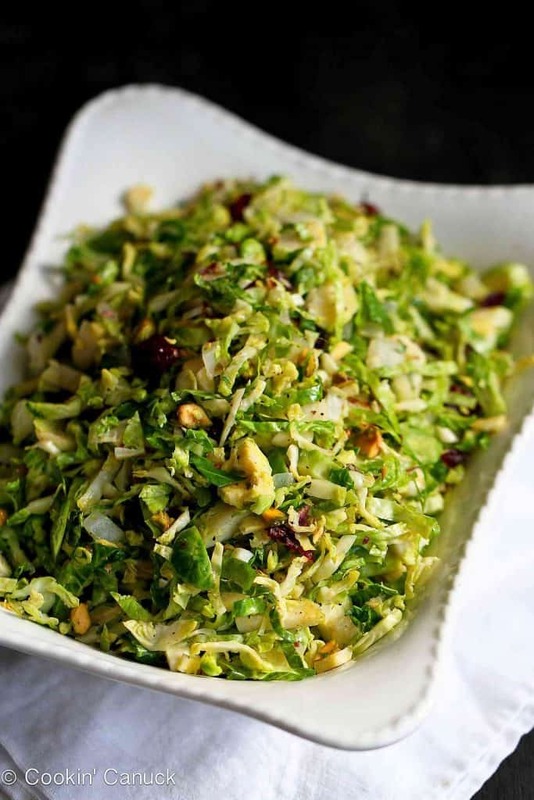 Recipes for shredded Brussels sprouts are always popular around our house, and this fantastic side dish recipe is ideal for a Thanksgiving feast, or any other fall or winter meal. Dried cranberries add a touch of sweetness and the pistachios add a little crunch. For me, the Parmesan cheese added enough salt so that I didn’t season with extra salt. However, please taste it before serving and season to suit your palate. Heat 1 teaspoon of olive oil in a large skillet set over medium heat. Add the onions and cook, stirring occasionally, until the onions are soft, 4 to 5 minutes. Add the remaining 1 teaspoon of olive oil to the skillet, then add the Brussels sprouts. Cook, stirring occasionally, until the Brussels sprouts are tender, but still bright green. 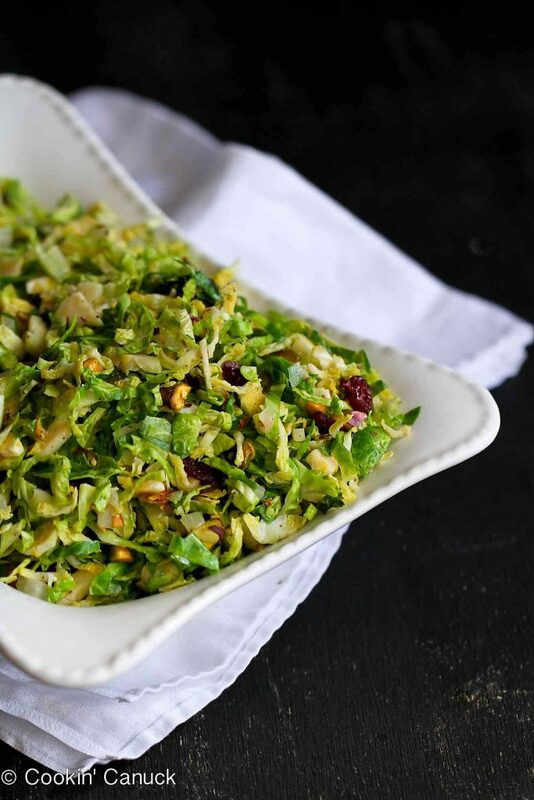 Stirthe pistachios, dried cranberries, Parmesan cheese and pepper into the sauteed Brussels sprouts. Taste and season with additional salt, if desired. Stir in the pistachios, dried cranberries, Parmesan cheese and pepper. Taste and season with additional salt, if desired. This post was originally posted on November 4, 2013, and has been updated. Disclaimer: This post contains links to my Amazon affiliate page. Any revenue made from sales through these links helps to support this blog. Thank you! 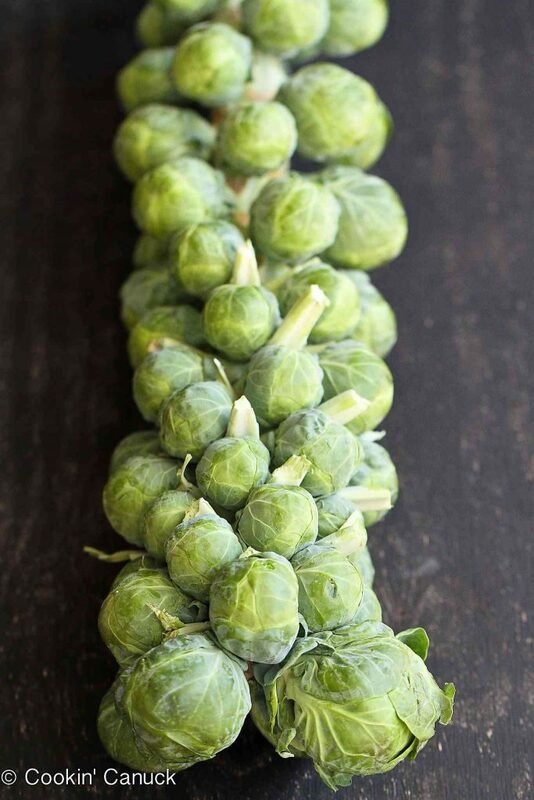 Isn’t that stalk of brussel sprouts the prettiest?! I love your addition of pistachios and cranberries! I love brussels sprouts made like this! Lovely! This sounds interesting and delish! Can’t wait to make it. I’m new to loving brussel sprouts and can’t wait to try this recipe. It’s beautiful! I never thought I’d say this about brussels sprouts – but this looks delicious! This looks delicious! I have never thought about shredding the brussel sprouts. I will have to try this. TJ’s also has shredded Brussel sprouts ready to go. I frequently toss them into scrambled eggs with things like bell pepper, onion and sweet potato. Gosh, I love Brussels and cranberries together! These are perfect for a healthy Thanksgiving side! I love shredded salads and this one is no exception! I love bussels sprouts so, so much. Definitely trying this recipe! I love brussels sprouts! My uncle make s shredded version with a curry butter every year. My favorite! Shredded brussel sprouts are a favorite of mine 🙂 this looks tasty! I made this tonight and the wife and I loved it. slightly time consuming to chop everything but the rest of it went very fast. Delicious. Warning: very easy to eat a lot of calories. These look tremendous and you’ve reminded me I need to add a swing by Trader Joes to my schedule. 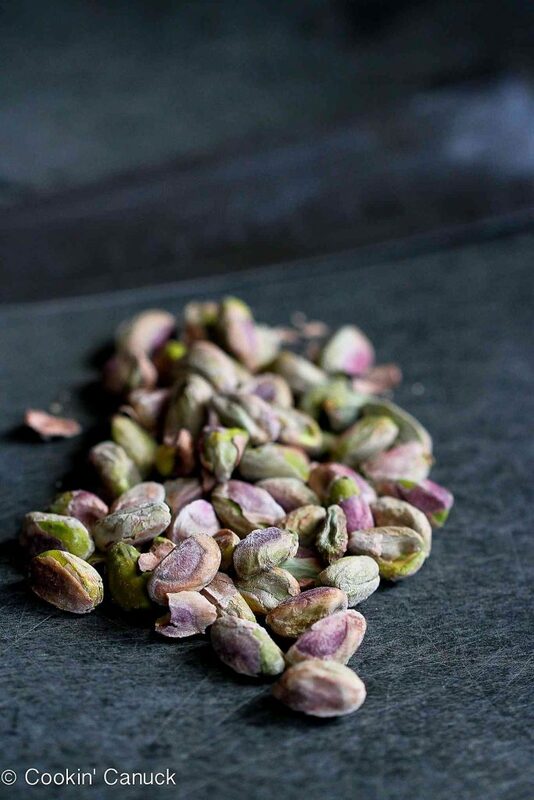 Do you use salted or unsalted pistachios? Hi, those sprouts sound delicious! I also buy the stalk at Tj’s and only have hideous childhood memories of them. Them is to cut them in half, place on a jelly roll pan, sprinkle with s & p, evoo, brown sugar, and basal mic vinegar. Quantities depend ho many sprouts your fixing. Toss all together then make sure the sprout halves are cut side down and place in HOT oven 550 F. For about 15-20 minutes. They should be bubbly hot and you won’t believe how good they are! Goes with all types of meats and meals. Happy Thanksgiving! “evoo” ? Not up to speed on that item! I’m trying to find where I actually wrote that in the post. I think I’m going cross-eyed reading through it over and over…would you mind directing me to where I wrote that? EVOO stands for extra-virgin olive oil, though I try to avoid actually using the acronym in my posts. Sorry about that! Aren’t Brussells sprouts trees the coolest? I think T J’s started carrying them 3 or 4 years ago at our store & we buy them constantly while they’re in season. Bought one last week, roasted with olive oil, salt & the wonderful African smoked pepper corns. We cooked them all, & I eat them like candy. Had them for one official meal & the rest I just snack on. I can hardly wait to try this recipe. I’m a vegan so will use the vegan Parm. Thanks so much, we’ll buy another tree next week & the rest of the ingredients & cook at least half of them for this recipe. Debbie, I’ve fixed them your way also, anything with balsamic vinegar gets my vote. How is this reheated? I want to make tonight and take to work tomorrow! Quite honestly, I have never tried reheating it because I would be worried about the Brussels sprouts wilting. As an alternative, you could serve it at room temperature. I have tried every different recipe for Brussels sprouts that you can imagine and the end result has always been that I just don’t like them. Since I really want to like them, I keep trying. Your recipe has finally broken the curse. Made it for Thanksgiving and loved, loved the taste. Shared the recipe with 3 others. I actually shredded the sprouts in my food processor with a slicing disc the night before and refrigerated in a ziploc overnight with the diced onion (separate baggie). Made cooking super quick the next day. Thank you for saving Brussels sprouts for me. Well, that just made my day. I’m so glad to hear that the recipe was such a hit, Felicia! It took me a long time to like Brussels sprouts, too. Shredded is definitely the way to go. This recipe was a hit on Thanksgiving – everyone raved about the dish! It was a tasty way to use up our homegrown Brussels sprouts. I’m so glad to hear that, Cindy! And how lucky you are to have homegrown Brussels sprouts. That may be something that we have to add to our garden next year. I took the leftover brussel sprout salad, filled a soup bowl with about serving size spoon of salad and added hot turkey soup, not only did it cool the soup, the textures made for a great lunch! Who would’ve thought…Thanks for the recipes and ideas, looking forward to the Christmas goodies! Has anyone ever served this dish cold? My boyfriend and I love brussel sprouts and I’m trying to figure out a side to bring to a BBQ this weekend. I doubt I’ll be able to heat it up once there so I was hoping it would still be yummy cold. I tried this and it was delicious!! Thank you! Just made this tonight as a trial run for Thanksgiving. My husband doesn’t like being guinea pigged. What can I say but, it was delicious, really delicious. I used more cheese, I just can’t help it. I love parm and my thinking was “my taste buds aren’t what they used to be”. Other than that I stuck pretty close to the recipe. I’m Notorious for not following directions very closely. I would totally recommend this recipe. It makes dry, boring Brussels sprout actually taste really yummy. I would love to know if anyone has tried this without the parm. I have two family members who cannot eat aged cheese for health reasons. I made this last year for Thanksgiving and it was a H.U.G.E. hit. But I would like to accommodate the dietary issues of my family for Thanksgiving this year. Hi Amy, I think it would work fine without the Parmesan. You may find that you need to season with additional salt to make up for the missing salt from the cheese. Happy Thanksgiving! I am getting ready to make this for Thanksgiving. Can I substitute fresh pomegranate seeds instead of dried cranberries? Can you serve it cold? Do you think it would still taste good? I plan on cooking and bringing to a Thanksgiving Dinner. Thanks for the recipe. Looks amazing! Hi Eva, I don’t think this would be as good cold. However, I think that this one would work well at room temperature. I hope that works out for you! I was making brussels sprouts this way but adding grated coconut to it,but today i cooked it adding pistachios and cranberries. It tastes delicious. Love the twist. Would you recommend substituting pine nuts for the pistachios? That would definitely work, Penni. Took this dish to a dinner with friends. They practically licked the bowl! So many requests for the recipe. I found it on google and decided to try this as a last ditch effort to cook brussel sprouts in a way that makes me glad to eat them. This recipe means I can quit saying NO to this vegetable. It sounds as though we grew up in the same household. Boiled Brussels sprouts for all! Blech. I tried out this recipe (pre-Thanksgiving auditions) on my family over the weekend and even my 12 year old liked it. This will be making an appearance on our Thanksgiving menu this year. Thank you! I found this recipe on Pinterest last week and made it for a dinner party last weekend. To my surprise, it was the biggest hit of the entire meal! Every single person raved about it and they all asked for the recipe. This will a repeat recipe for sure. Brussels are my favourite. Really, I could eat them every day. Great recipe! These flavors are SO complementary! What a perfect way to serve brussels sprouts. Brussels sprouts obsessed! Want this! I loved your comment about your kids being shocked at how brussels sprouts grow – both my son and my wife had no idea until last week! Made me laugh. 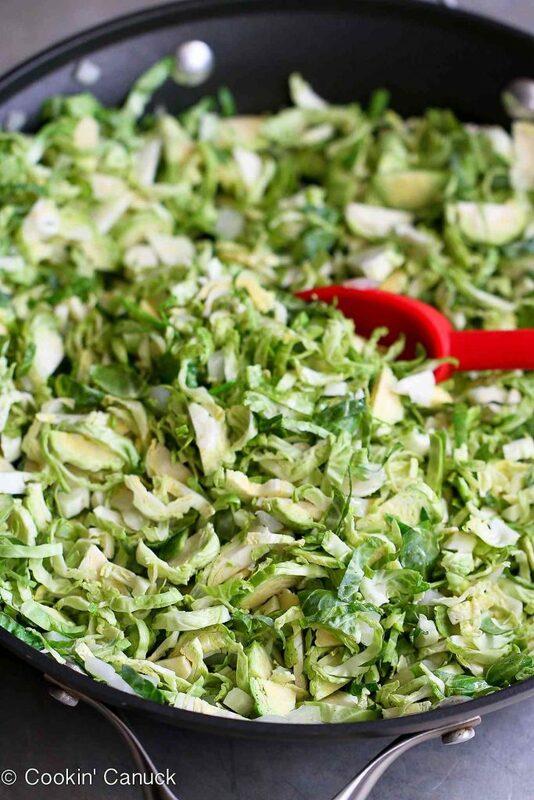 This recipe sounds so delicious and a great use of brussels sprouts! this looks amazing! i’ve made brussels sprouts slaws but never with cranberries…. it seems like a perfect addition. definitely going to try this out as soon as possible! Your Shredded Brussels Sprouts recipe looks really healthy and delish, Dara. What do you think about using dried currants or dried raisins in case dried cranberries are not available? And thank you for adding pistachios in this recipe – I love them! I also like almonds and pine nuts; and might just try adding some of them when I make this over the weekend. I’ll let you know how it goes. Hi Elizabeth, I think dried currants would work well. I’d be inclined to try dried cherries over raisins, however. I hope you enjoy it! This is the dish that made me fall in love with shredded Brussels sprouts. Hmm..yea, I think I got where you’re going with this. Putting aside my not being a raisins fan, I think the flavor would just overpower and won’t match with the rest of the ingredients unlike the others. Thanks for the tip! I hope I don’t mess mine up and end up with an unsatisfactory meal. Haha! Great recipe. Super easy. I was worried the cranberries would be too sweet but I chopped them up very small and the bit of sweetness worked perfect against the slight bitterness of the Brussels sprouts. I would try pomegranate or dried tart cherry which I think would work too. Did anyone try fresh cranberries? The print tab for this recipe is not working. Hmm, I just tested it and it appears to be working now. If you continue to have difficulties, please let me know.